During an appearance on "America's Got Talent" season 13 finale earlier tonight (Wednesday, September 19), KISS confirmed that it will embark on its "farewell" tour, dubbed "One Last Kiss: End Of The Road World Tour", in 2019. The news was delivered in trademark larger-than-life KISS style with a blistering performance of "Detroit Rock City", proving why the band is known as one of the most iconic live performances that simply can't be missed. 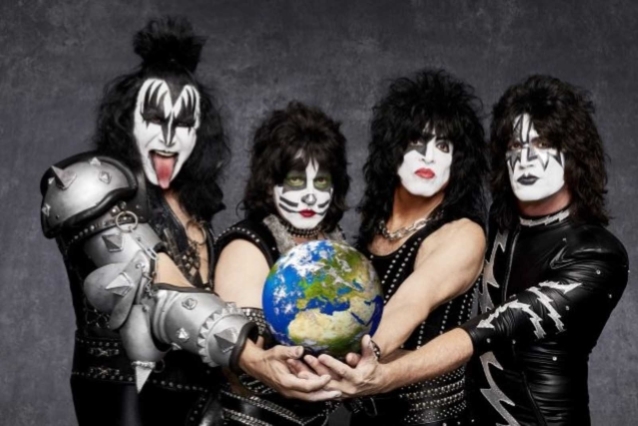 Said KISS frontman Paul Stanley: "This is gonna be our last tour. It will be the most explosive, biggest show we've ever done. People who love us, come see us. If you've never seen us, this is the time. This will be the show." KISS added in a statement: "All that we have built and all that we have conquered over the past four decades could never have happened without the millions of people worldwide who've filled clubs, arenas and stadiums over those years. This will be the ultimate celebration for those who've seen us and a last chance for those who haven't. KISS Army, we're saying goodbye on our final tour with our biggest show yet and we'll go out the same way we came in... unapologetic and unstoppable." Gene Simmons recently told Sweden's Expressen newspaper that KISS's next tour will last three years. Calling it the band's "most spectacular tour ever," the bassist/vocalist added that the trek will make stops on "all continents." Rumors of KISS's final run of live shows gained strength several months ago following the news that the band was attempting to trademark the phrase "The End Of The Road." An application from KISS was filed in February to the United States Patent and Trademark Office, which means that the band could use it in connection with "live performances by a musical band." As most fans remember, back in 2000 and 2001, KISS already performed a "Farewell Tour". The trek, which was the last to feature drummer Peter Criss, played 142 shows over five legs, covering North America, Japan, and Australia. Stanley later said that the 2000 tour was nothing more than an attempt by the group to "put KISS out of its misery" after years of ego clashes and disagreements over songwriting credits between the band's original members. "The 'Farewell Tour' was to get off the stage with our tails between our legs while we still had some self-respect left," Simmons explained. "And it became very clear the fans didn't want us to go." Simmons said in a 2017 interview that KISS had "a few more years" left before it would call it quits. He told Glasgow Live: "We're the hardest-working band in show business. I wear over forty pounds of studs and armor and all that stuff, seven-inch platform heels, spit fire and have to fly through the air and do all that stuff." He continued: "In hindsight, it would have been smarter to be a U2 or THE [ROLLING] STONES, to wear some sneakers and a t-shirt and you're comfortable. No, we had to do it the hard way. "So we're not gonna be able to do it into our 70s, and I'm 67 now," he explained. "We'll do it for a few more years, and then when we think it's time to go, we'll go, and we'll do it the right way, with a big party. I'd like to think that we would do something that rocks the planet — something big and worldwide and maybe free." Earlier this year, Stanley said that he wasn't sure "about the idea of KISS coming to an end. We've built something that's so iconic, and I think it transcends any of the members so I can certainly see me not being there, seriously." He also spoke about his reasons for wanting to spend less time on the road. "I don't want to go leave home," he said. "I have a family and I have children and, honestly, I think my primary responsibility is to be a dad, and I don't want to miss out on that. And certainly, as we got older, we know that life is finite and I pick and choose what I want to do at this point."